LVD Strippit, Akron, NY, has released a new version of its programming and shop management software, Cadman Suite version 8.5. The release includes enhancements for modules in the integrated suite of Cadman software products, an improved dashboard for more intuitive use, and extended integration capabilities that include the next generation of LVD Strippit’s Touch-P punch press control, as well as non-LVD Strippit cutting and punching. Enhanced Cadman-B bend CAM software for finding bend solutions include tool preselection based on active catalogue(s) and preferred (custom) tooling that can be selected, followed by several checks ending with a collision check on a 3D virtual production line. Cadman-B also is available for LVD Strippit Synchro-Form-series press brakes. Synchro-Form is an adaptive bending system designed for bending of XXL profiles. Touch-B control-software improvements include optimized sequence change —time between bending parts—resulting in higher press-brake working speed and higher productivity. Advanced nesting capabilities for laser cutting and punching include new functions such as minimal heat impact while finishing parts one by one, material-thickness-defined parameters, and material and material-condition-technology cutting tables for automatic preparation for laser cutting. For punching, smart functionality such as “avoid hits with form tools” and “punch with form tools last” ensure reliable punching preparation. In the common module, parts can be detected automatically or manually in a multiple-part drawing. Ability to connect Cadman-Job software to the Touch-P control for LVD Strippit punch presses and nonLVD fabrication cutting equipment. The software connects the front office intakes and processing of orders with shop floor operations, facilitating a controlled process from the order to the finished part. The software provides real-time insights from the shop floor so users can optimize machine production time and fabrication resources. 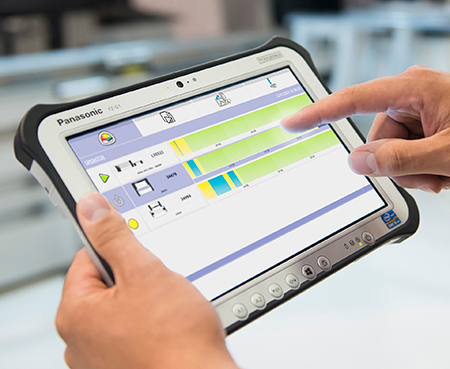 The Touch-i4 tablet, which works as a companion to Cadman-Job and helps sort parts after cutting, has the added functionality to assign parts to a certain location, which can be an identified carrier or warehouse position. Cadman-SDI, Smart Drawing Importer for generating accurate cost estimates from imported CAD files has built-in cost drivers that help fabricators identify what’s driving their indirect manufacturing costs to determine the true cost of a part/product. Cadman-SDI also offers more functionality for file exporting and improved batch importing capability. Additional cost drivers, including the length of the longest bend and maximum required bend force, are part of the information on the display or in the export file.